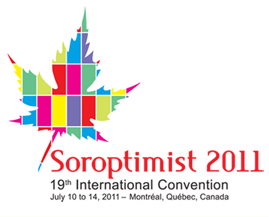 Who is Soroptimist International ? Soroptimist International (SI) is an international service organisation for women in management and professions - working to advance human rights and the status of women and girls. Soroptiùist International has more than 3000 clubs in 123 countries and territories. What is our purpose ? Since 1921, Soroptimists have worked to improve the lives of women and girls and are committed to serving women and girls in local, national and international communities through our programme strategies. Soroptimists seek to be a global voice for women through awareness, advocacy and action. Through Soroptimist International Quadrennial Programme of Service, projects are carried out in the areas of Human Rights and the Status of Women, through Education, Economic and Social Development, Environment, Health and International Goodwill and Understanding. Soroptimist International members are encouraged to be aware of and involved in issues of society. They address a wide spectrum of women's concerns professionnally and voluntarily, working with all levels of civil society including states, governments, the UN system, non-governmental organisations, as well as other actors of civil society including business. SI is non-party-political and non-sectarian. Consultative Status with the United Nations Industrial Development Organisation (UNIDO). Soroptimist International is also a Board member of CONGO and accredited to the Commonwealth. SI has representatives at the United Nations Centres in New York, Paris, Geneva, Vienna, Rome, Nairobi and the Regional Commissions. SI works in partnership as an international non-governmental organisation. Soroptimist International and its partners work together to help implement the objectives agreed by governments in these important documents.